Courgette and butternut squash with sweetcorn, peppers and spring onions. 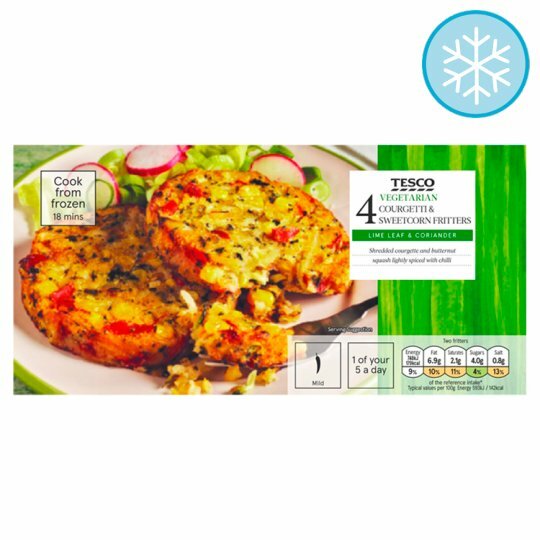 INGREDIENTS: Courgette (20%), Butternut Squash (18%), Sweetcorn (15%), Red Pepper, Potato, Rapeseed Oil, Rice Flour, Spring Onion, Dried Potato, Stabiliser(Pea Fibre), Garlic Paste, Sugar, Salt, Coriander Leaf, Lime Leaf, Chilli Powder. Instructions: Oven: 200ºC/Fan 180ºC/Gas 6 18 mins Place on a baking tray in the centre of a pre-heated oven for 18 minutes.